Excellent product for getting into packrafting. 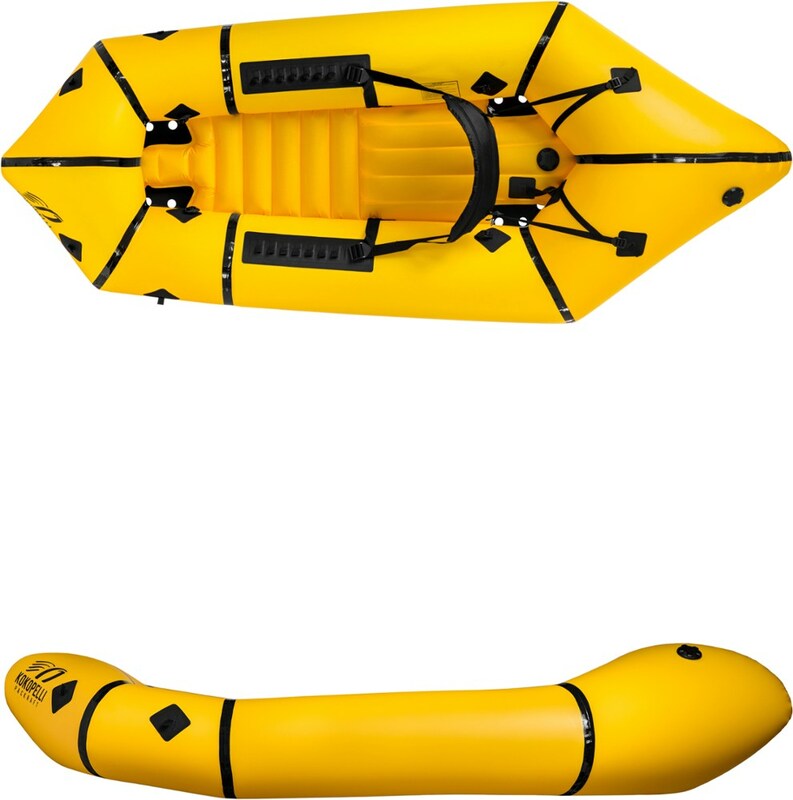 Durable, easy to inflate, fine for short paddle trips away from roads. Too bulky to carry on a long backpacking trip. I'd been wanting to try packrafting, so when I found the NRS Packraft on clearance at REI, I picked it up. 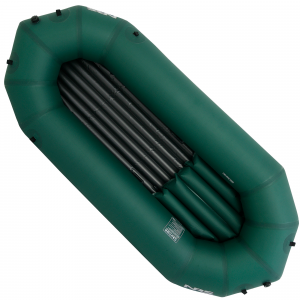 I'd been reading reviews of the Alpacka Rafts, and this product is heavier, bulkier, and less evolved than those top-of-the-line packrafts. 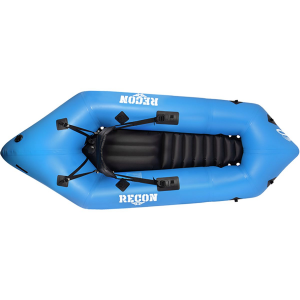 But the NRS raft is much cheaper (especially on sale), was available locally, and lets me try out the sport. 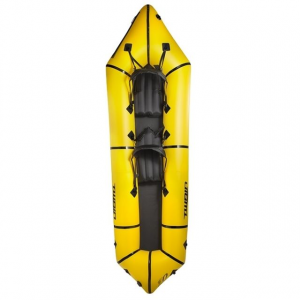 I could always rent an Alpacka via mail order if I wanted to do a challenging packrafting trip. The first issue was a pump or inflation bag to fill it. I had a plastic pump made for rafts and canoe flotation, but found none of its half dozen adapters fit the large dump valve or the hose valve for mouth inflation. Finally I realized that the bare pump hose with no attachment would work on the raft's hose valve. And I went out and bought a few inches of plastic tubing to fit the hose valve, attached it to the corner of a large plastic bag with zip ties, and had a very functional inflation bag. With the plastic bag inflator, I can fill the raft in about 10 minutes. 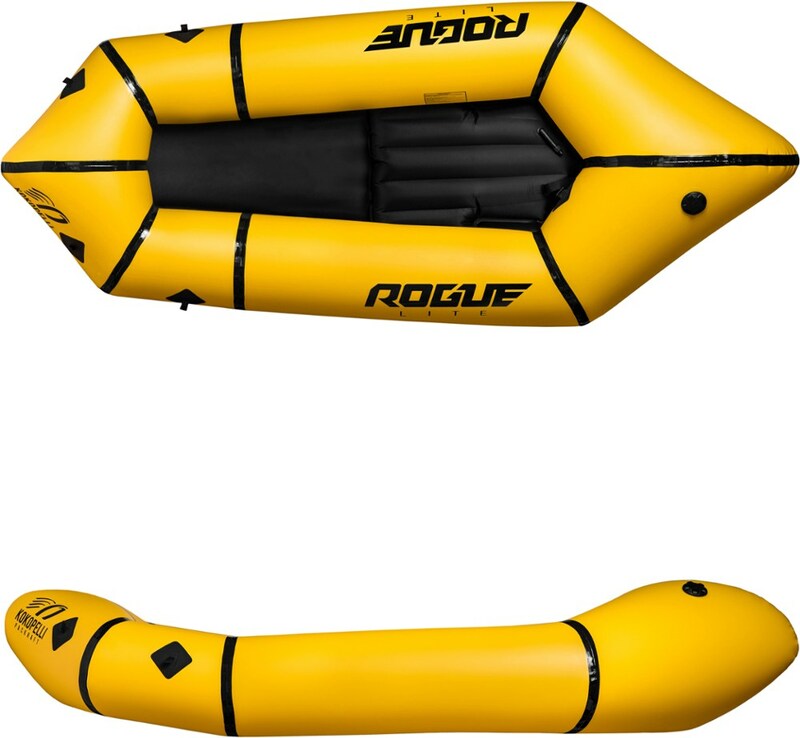 This raft has two independent flotation chambers, one for the front and left side, the other the rear and right side (or vice versa, not sure). It wouldn't exactly be a stable boat if one chamber punctured, but at least you'd have some flotation. 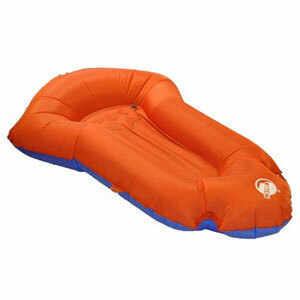 There is also an inflatable seat and removable inflatable floor (which could be used as an air mattress for sleeping). Each end of the boat has some lash points to tie in gear or attach a hand line or painter. Regarding paddling, I find the seating position too far back for good boat balance (I'm 5'6" and about 110 lb). Putting a dry bag of gear between the rear tube and my back moved me far enough forward to improve the boat's balance and handling. I first paddled it with a 210 cm kayak paddle but got extremely wet from paddle drips. A 230 cm paddle works much better with this boat due to the width of the tubes the paddle has to reach over. I picked up a moderately cheap 4-piece 230 cm paddle to use with this boat. You notice significant side-to-side waggle of the front end while paddling, a function of its short length and lack of any keel line. It's much slower than a hard kayak, but that's just physics. This boat isn't a good choice to accompany your friends in hard kayaks, as you'll be quickly left behind. But for its intended usage — paddling ponds and small rivers away from roads — it gets the job done. It should be able to handle class II whitewater with no problem, but I haven't had a chance to try that yet. It has no spray skirt or deck to keep out waves, so isn't recommended for harder whitewater. 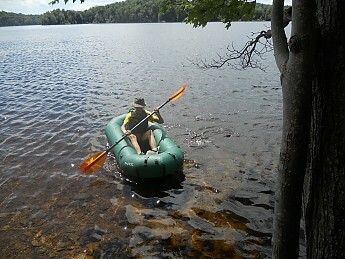 So far I've packed the NRS raft two miles up the Appalachian Trail to paddle a remote pond. It took up most of a 3000 cu. in. pack, and I had the paddle sections and PFD strapped to the outside of the pack. Can't imagine fitting this into a pack with overnight gear. I've also biked with the raft. It fits nicely in a large Ortlieb pannier, with paddle and PFD in the other pannier. This allows me a one-way paddle with car on one end and bike on the other. It should be possible to strap a bike, with wheels removed, onto the front of the raft, but I haven't tried this yet. Overall this is a good product and appears very durable. It has limitations and isn't an Alpacka, but it does provide the opportunity to paddle in places you can't go with a hard kayak. Nice review, Deb! Thanks for taking the time to share it. I'd love to see some pictures of your packraft, if you're willing to share some in your review. It sounds fun!